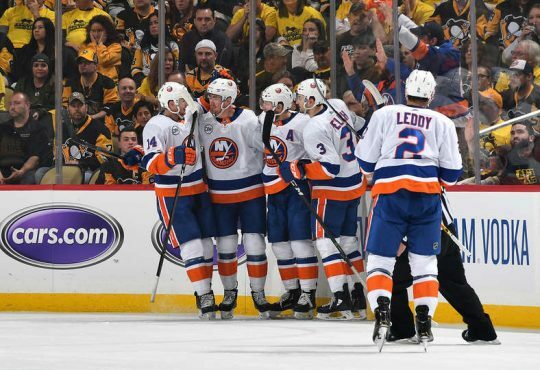 While quickly approaching a single-digit amount of games remaining in the regular season, the Barry Trotz-led New York Islanders look to heal up, and reestablish their consistent play from the first half of the season. Beware of the “sky is falling” mentality from the layman fan. Because it’s certainly going to be creeping in droves over the next couple of weeks if the Islanders do not finish strong with their remaining schedule. In their last ten games played, the again First-Place misfits have won 6, and dropped 4. Or, to be more clear, the lack-there-of. Looking through the microscope of the last 10-games, the numbers don’t lie, and can/will be viewed as concerning. The Islanders have indeed outscored their opponents in this latest stretch, but only by a slight margin. While accumulating 27-goals, they’ve surrendered 24, for only a plus-3 differential. Not exactly ideal, especially when keeping in mind that this 10-game stretch includes the 6-1 drumming of the Leafs from “Welcome Home JT Day” at the Coliseum. Top-Six, Where For Art Thou? 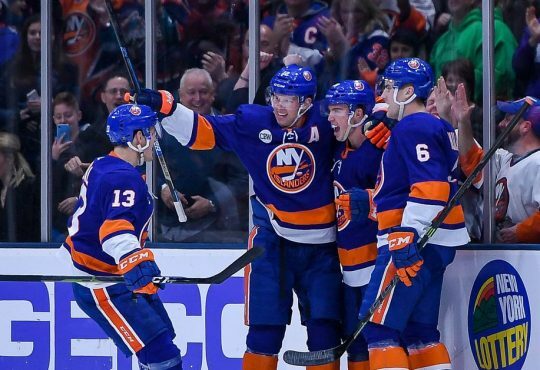 Where is this elusive top-six of the Islanders? They need to get on track, and stat. The immediate comments I’ve been filtering through from fans and experts alike is the dreaded “thanks for doing nothing again at the deadline” mantra everyone who’s followed this franchise for awhile has grown accustomed to. Let’s try to look at this from the outside, as a non-fanatic for a second. The Islanders need to get their top-six going, or they’re going to have a bad time. 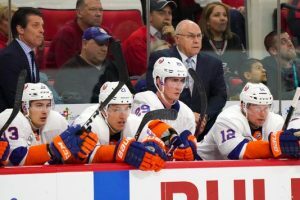 On paper, (cue the hate mail), the Islanders top-six should, in reality, be more than serviceable. Now, now…. Hear me out. First, let’s go over who the top-six essentially are, in no particular order. The Kid Who Won The Calder put up 22-goals, and 63-assists, totaling 85-points in his opening campaign last year. He’s shown that that he’s more than capable of carrying a bit of a load even at the tender age of 21. Through 72 games this season, he currently sits with a 17-goal, 41-assists, 58-points stat-line, leading the squad in points overall. Granted, down from last year – but his improved two-game, own-zone coverage and responsibility would really need to be factored into his loss of point production. I’m ok with the trade-off, assuming it results in more wins (which, well – first place anyone?). In the last ten-games, Barzal has put up 7-points, all of which have been assists. Through his first 4 full-seasons, he’s averaged 28.5-goals per season. In those last 4 seasons, you can sprinkle in a remarkable 40-goal effort last season, and a lack-luster 15-goal season to make up that average. This year, along with his added leadership responsibilities, he’s tallied 27-goals in 72 games. In the last ten-games, Lee has 6-goals, and zero assists, for 6-points. The man’s in his contract year, and all signs point to him being resigned after this season. From all the grumblings, which in all honesty, I’d take with a grain-of-salt (Tight lipped Lou Rules, especially with contract negotiations), that term is the only barrier at this point for getting a deal done. 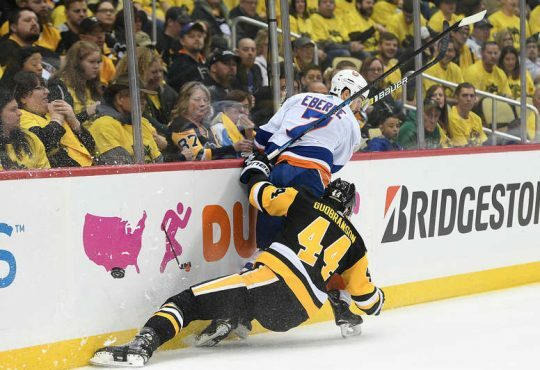 10 April 2015: New York Islanders center Brock Nelson (29) forechecks during the first period in the New York Islanders 3-1 win against the Pittsburgh Penguins at the Consol Energy Center in Pittsburgh, Pennsylvania. to say, those guys don’t exactly grow on trees. His defensive play and face-off has improved leaps and bounds under Barry Trotz. He’s proven himself to be a worthy number-2 center. In his last ten-games, Nelson’s put up 3-goals, and 3-assists, for 6-points total. Another guy who I think should be re-signed after this year. He’s proven to fit into Trotz’ scheme rather nicely, and well, again – 20-goal guys just don’t grow on trees. He’s going to get paid by someone. He’s averaged 37.7-points in his 10 year career. His best point production has come from these past 3 seasons (this season included), which is a good sign with his most recent contract. 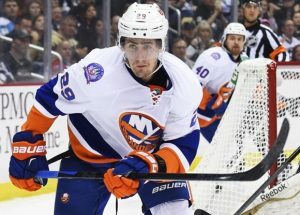 He’s currently sitting at 14-goal, 36-assists, for a 50-point total through 72-games, placing him with the second-most points on the team behind Mathew Barzal. Oh, Josh… Where have you been the last ten-games? 3-assists total, none of which have come in the last six-games. Not exactly at the “elite” level. This is a tough one for me to harp on too much (unlike a certain rabid bunch of Isles fans who are fully entrenched on the Josh Bailey hate-train). Bailey’s been subsequently moved from line to line, in an effort to get him going. If there’s a concern to come from that, the reason Trotz gave for him flip-flopping Bailey throughout the line-up, specifically putting him with Komarov and Filppula was to “get his legs going again”. Um, I don’t like to hear that about someone who has been an all-star winger. If there’s a guy that you can say has struggled since the the transference of power from Garth and company, to Lou’s crew – it’s been Jordan Eberle. The perennial 20-plus goal, 50-plus point player has seemingly disappeared as of late. In 68 games played under Trotz, Eberle’s stat-line is 14-goals, 17-assists, for 31-points total. Not exactly in the wheelhouse this league is used to seeing Jordan play at. Watching his play over his last 10-games, you can see him pressing when he gets in the offensive zone. The positive being, when he has the puck, good things are still happening. His stats over these 10-games would beg to differ. 1-goal, 2-assists, for 3-points, and that includes 2-assists he got in the JT Welcome Party game. He’s only 21… He’s only 21… He’s only 21. 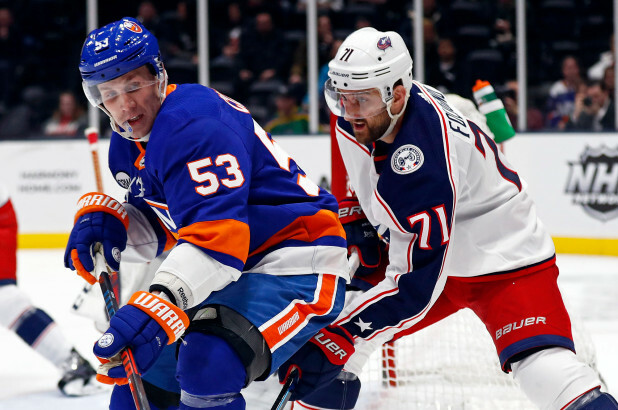 In a league that’s quickly becoming impatient when it comes to waiting on talent to progress, you need to keep in mind and DO NOT FORGET – Anthony Beauvillier is only 21 years old. In 71-games played, he’s put up 16-goals, 8-assists, for 24-points. Keep in mind, this goal production is all while being shuffled throughout the line-up, as I think it’s safe to say he’s been moved around more than the rest of the crew when it comes to line-mates. He could very well put up another 20-goal season if he hits one of those hot-streaks he could get into. That would be two 20-goal seasons in his first 2 seasons. Did I mention he’s only 21 years old? His last 10-games leave little to be desired, not unlike the others, with only 2-goals, and 1-assist during that time period. Blah, blah – What’s your point? The point is, these aren’t guys that you can just be so quick to send off in a deadline deal. Using Eberle as an example (since everyone was convinced he’d be a guy dealt), by trading him, you’re trading a proven 20-goal scorer who’s under 30-years of age. Period. You better get that back. You have to throw out that he’s struggling currently – yes, I realize that’s difficult to do. Players that have put up 20-goals on a consistent basis have a tendency (more than not) of getting back on track. Yes, I know he’s a UFA after this year, but if the return isn’t going to present you with a replacement for those 20-goals, plus some with a contract that still has term – why bother?! There was a rumor floating around that Lou Lamoriello was in on Matt Duchene and Mark Stone. The package offered was rumored to have included Anthony Beauvillier (at least for Duchene). If that’s true, (who knows, Lou’s rules) then it would prove that he was looking to improve this team for a cup run. It take two to tango, and Lou didn’t have a partner. OK, Great – So How Do You Fix This? Well, here’s the thing… (Terrific, there’s a “thing”). Do I think a trade at the deadline would’ve put this team in a better position? 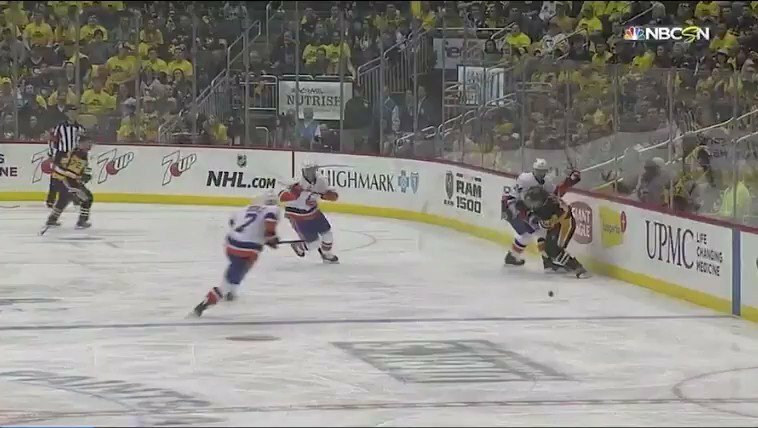 Casey Cizikas, the cog that continues to keep the New York Islanders moving. I know fans are tired of hearing it, but you can’t really put a price on the chemistry make-up of a hockey team. Case in point, take a look at some of the teams that made a splash at the deadline. Is Columbus any better than they were before loading up with Duchene and Dzingel? You could argue either way. But the fact remains, they’re still a bubble team, no matter how good those acquisitions looked. This make-up of this team is LIGHT YEARS different when that “Best Fourth Line In Hockey” is rolling. It’s scary in every way possible. Scary that a team relies on a “fourth line” to set a tone for the entire game, and that when they’re NOT together as a whole, the team seems to struggle comparably. I’d personally put most of the praise on Casey Cizikas when it comes to that, since when he’s the guy missing, the team dynamic shifts dramatically with their line combinations. 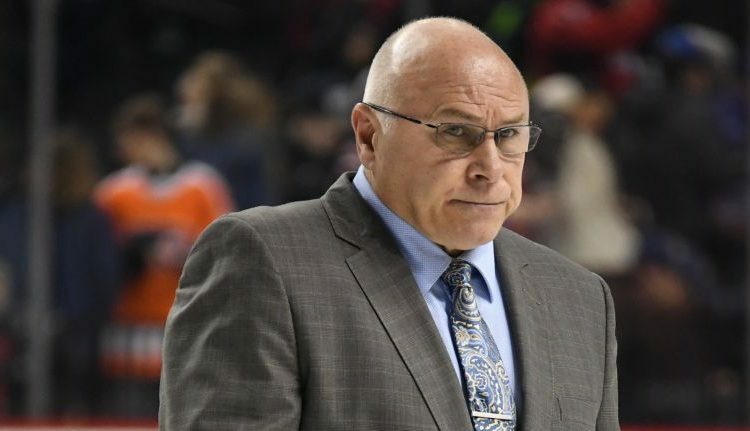 Trotz has said it himself, that line just compliments itself so well. They all know each other’s roles, and they abide by it. You’ll rarely (if ever) see any of them out of position. And, if one of them gets caught, another is always there to assist – that goes for all 200 feet of ice. I guess my point would be, and granted it’s not a very good one to be honest, is that Fourth Line needs to be healthy, or this team is going to struggle to score goals. No, not ideal at all. 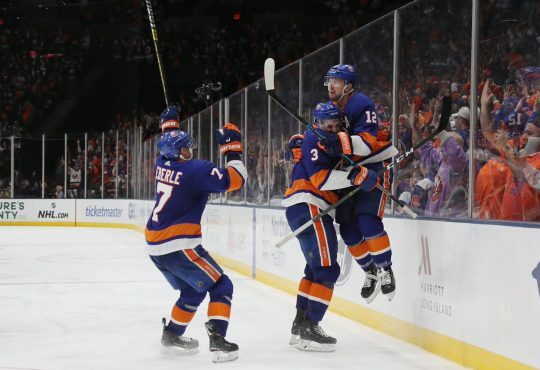 I’m admittedly too lazy to do the analytical work on this, but I think it’s a safe bet that when the Cizikas, Clutterbuck, Martin line is going – the Islanders are scoring goals.